Making a left turn just as the light turns green, pulling out before the oncoming traffic. Most people in Pittsburgh allow and encourage this behavior. Looking at the top pic from the Dormont area, that’s no kind of a Pittsburgh Left that’s more of a “Hey-I-need-to-leap-frog-over-to-THAT-street-cuz-I-only-know-ONE-way-to-get-where-I’m-going” Left!! 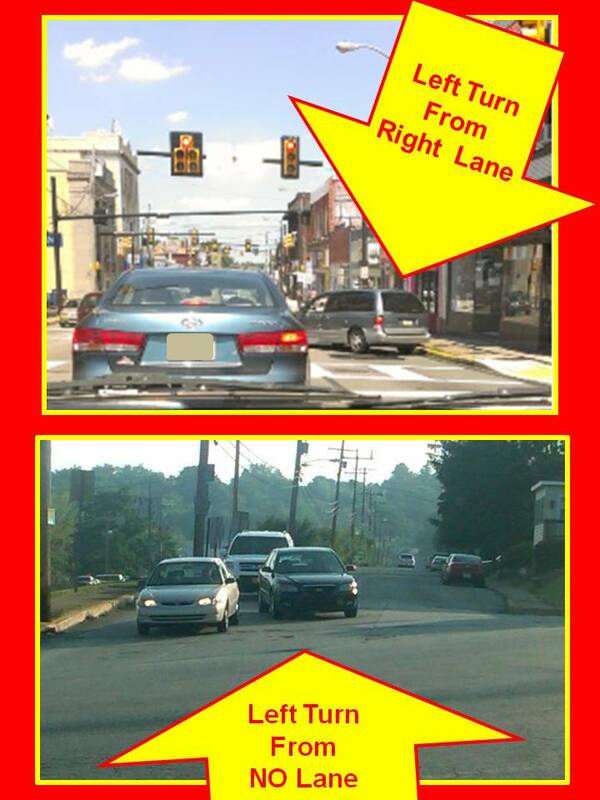 And the bottom pic IS a Pittsburgh Left except for the fact that the rules for the Pittsburgh Left do not permit you to pull out around from the car in front of you, CREATE YOUR OWN TURNING LANE, and taking aim, like a kamikaze, at the oncoming traffic! Which is what our Jagoff Catcher saw happen in THIS case. These two photos show EXACTLY why we created this website…. to point out ignorant, impatient, self-important people like these two drivers. In the mini-van case, do ya HAVE to make that left RIGHT THERE or can you pull out in the traffic normally and make the NEXT LEFT???? Do you really not know your way around town so much that you have to make THAT left and hold everyone else up? In the second pic, all Pittsburgh Lefts are to be respected, but in YOUR case, we would hope that the oncoming vehicle was an outta control backhoe that would have the back half of your car stuck to its shovel as it moves forward down the road. Bottom line, unless your kids just called your cell phone and asked, “Hey, where do we keep our FIRE EXTINGUISHER?” wait your damn turn TO TURN, Ya Jagoffs! Thanks to @SoothingDave and @Spode411 for being our Honorary Jagoff Catchers today! Next articleApoulstered Roll-Over Bar? NOPE! What do you wanna bet neither of these Jagoffs used a turn signal? Half of todays drivers do not know what that little thingie on the left side of the stearing column is. What has happend to drivers training?